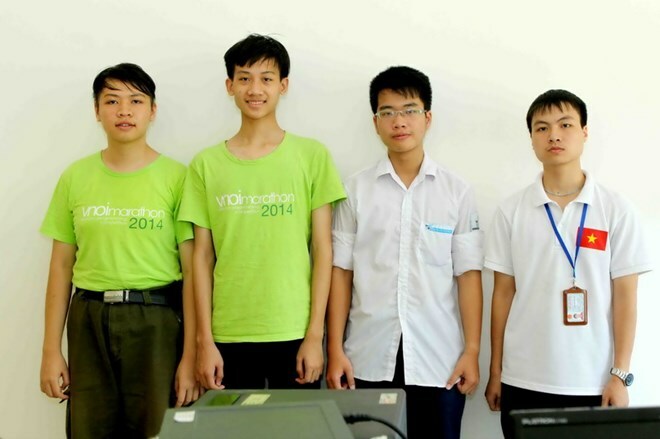 All four Vietnamese students won medals, including one gold and three silvers, at the freshly-ended International Olympiad in Informatics (IOI) 2015 in Kazakhstan. With these good performances, the Vietnamese team ranked 8th among 84 participating squads from all around the globe and topping the Southeast Asian region. According to the Ministry of Education and Training’s Department of Education Testing and Accreditation, this is the highest result that Vietnam has recorded at an IOI since 2000. The only gold medal came to Pham Van Hanh, a 12th grader from Hanoi National University’s Gifted School for Natural Science, while Hanh’s fellow students, Phan Nhat Minh, Nguyen Viet Dung and Nguyen Tien Trung Kien, bagged the three silvers. The Ministry of Education and Training plans to hold a welcome ceremony for the team and present certificates of merit to its members at the Noi Bai International Airport on August 3. First held in 1989 in Bulgaria, the annual IOI is one of the most prestigious computer science competitions for school students in the world.